Take the skin and the bones off the trout and break into bite sized pieces. Peel the eggs and cut in quarters. Place the salad leaves, tomatoes and shallot in a large bowl. Add fresh dill according to taste. Fold in the trout. In a separate bowl, mix together the sour cream, lemon juice and dill and season with salt and pepper. 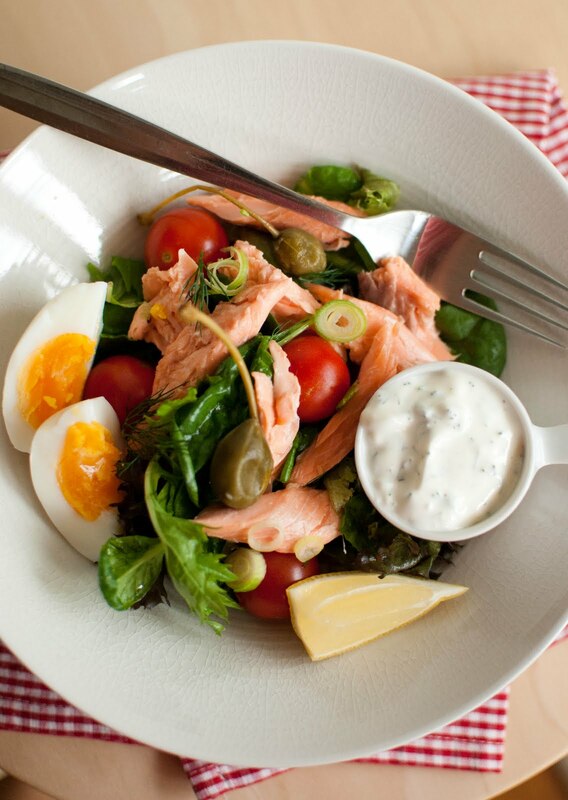 Place some salad on a platter, top with eggs and serve with the dressing. Delicious! You've just reminded me I need to start smoking my own fish again. I love it! Raikkaan näköistä ja niin ihanaa kalasalaattia, nam. I love hot smoked trout and with egg and caperberries. ooh I can taste it now. Very colourful too - that's always a good sign it's healthy. I seem to manage on 5-6 hours of sleep a night regularly although I'm sure my body is crying out for more sleep! Lovely and fresh! Your list is a must. Beautiful and interesting blog. 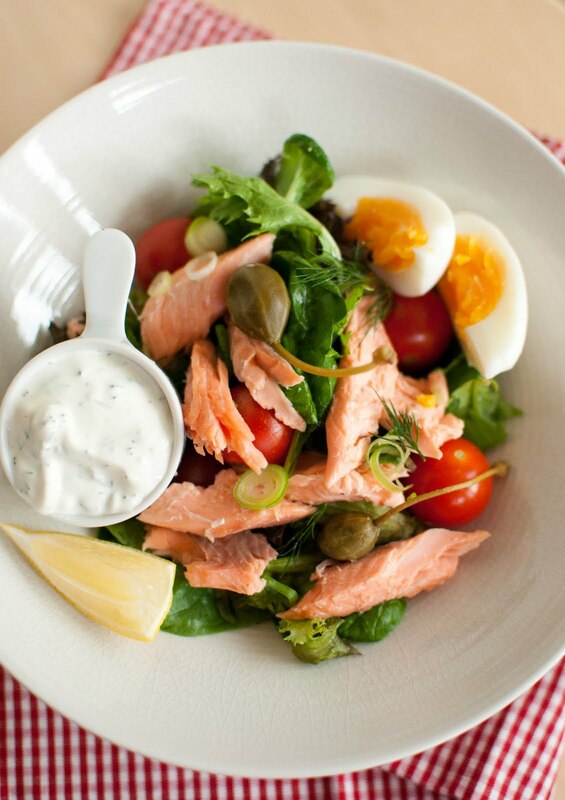 MMMMMMMMMM,..I love smoked trout in a lot of my dishes & your salad looks fabulous! Lovely salad, especially with that flavorful dressing! what a beautiful salad!! your pictures are just so pretty:) thank you for sharing this and have a great day. This salad looks so fresh and easy! I love super fast dishes, especially if they're healthy too! Yeah, this looks like it lives on the border of 'Fantastic' and 'outstanding.' I'd certaily agree with you, this is real food. I don't think I've had smoked trout but if it's anything like smoked salmon then I know I'd love it! Sounds like a great salad. 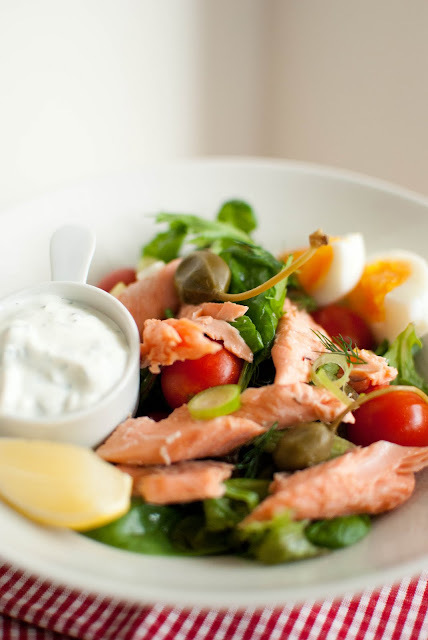 Love smoked trout and egg, lovely! THIS Is by far the most healthiest fast food I've seen.. I wonder if I can use your recipe for yoghurt instead of sour cream? (for the dressing)?